Northwood's Swirl is sometimes called Interior Swirl or Ribbed Swirl. 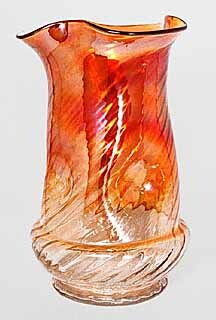 There are several variations of the pattern, but are all rather similar to the pitcher and tumbler above. 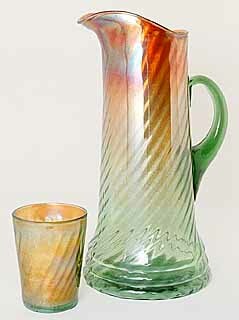 This example is in green with marigold iridescence on the top third only–a treatment Northwood called “Alaskan.” The pitcher and tumbler sold in 1996 for $220 and $105, respectively. On the right is a whimsey vase made from a pitcher. It sold for $230 in 1997. 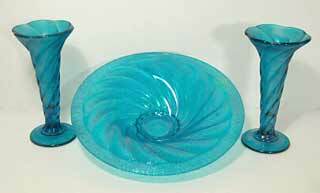 This vase and centerpiece bowl set in sapphire blue sold in 2007 for $1,025. The bowl is 10 1/2 inches across. 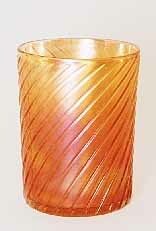 I'm not sure who made this interesting Swirl tumbler, but it has the swirls on the exterior rather than the interior. Courtesy of Carl and Eunice Booker.